originally written for Cutting Edge Permaculture, Sydney. Permaculture has been described as revolution disguised as organic gardening. In October 2011 I orchestrated a small revolution in my own life by leaving Sydney for four months to spend time outside the city to do a PDC for Women with Lea Harrison, some meditation retreats and WWOOF on permaculture properties. While barely leaving New South Wales, it was the most life-changing and world-expanding trip I've made to date. 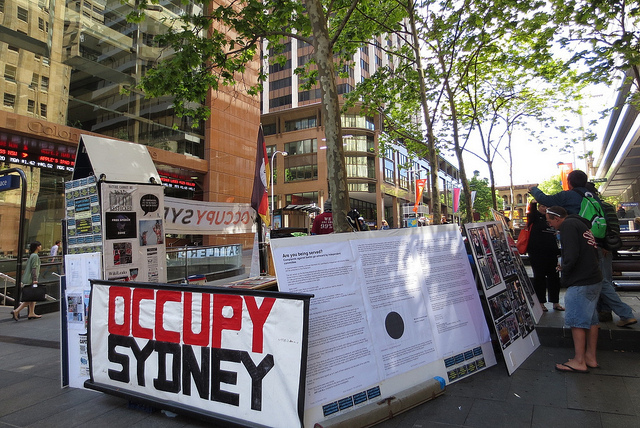 Just as I was off to explore different ways of being in the world beyond Sydney, Occupy Sydney sprouted on Martin Place. One of the many actions that mushroomed across the globe from the Occupy Wall Street movement, it sought to raise awareness and support for those left homeless and indebted in the wake of the global financial crisis and point to the blatant inequities of our dominant world reality - the consumer capitalist system. A true people's movement, involving many political ideas and organisations aligning to call for human need before corporate greed, it has expressed itself worldwide through the simple gesture of encampment in public space and spotlighted urban homelessness in the process. 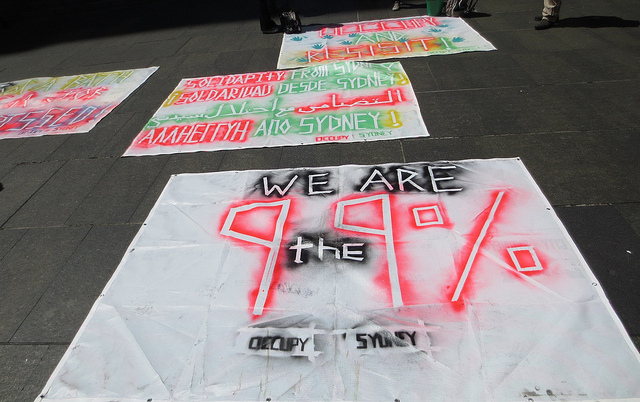 Claiming "We are the 99%" and "We are the ones we've been waiting for", by the time I returned to Sydney there were reports that the camp outside the Reserve Bank of Australia had been dismantled by police and it seemed as though I had missed the whole phenomenon. "The only thing I’m afraid of is that we will someday just go home and then we will meet once a year, drinking beer, and nostalgically remembering “What a nice time we had here.” Promise yourselves that this will not be the case. We know that people often desire something but do not really want it. Don’t be afraid to really want what you desire." 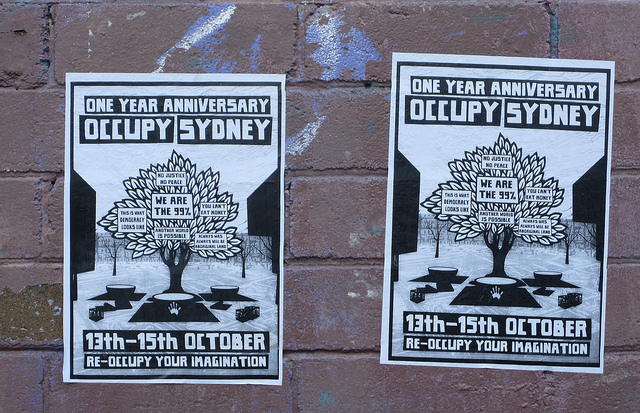 Simultaneously street posters for a weekend action to mark the one year anniversary of Occupy Sydney started popping up in my neighbourhood. Contrary to the media message that the camp had been cleared, a presence and program of talks and screenings had been maintained on Martin Place all through the year. Dropping in for a while on the anniversary weekend I got to see a lot of camp documentation, chatted to an artist peer who'd been an active participant and met a man who'd successfully defended himself in court against illegal arrest. I heard about some of the internal politics typical to many working groups and as a handful of marchers arrived to Martin Place from Circular Quay, the overt police presence had my Occupy friend wary and wondering if this action wasn't a saying goodbye to Occupy Sydney. I couldn't stick around for a talk by economics professor Steve Keen or the Occupy yoga class, one of the many events scheduled for the anniversary celebrations, but left with a ground view glimpse of the occupation and it's cagey reception by the civil powers that be. 'Occupy the Seed!' was an alternative moniker for Seed Freedom Fortnight, which also took place in October. Initiated by Navdanya, a women centred movement for the protection of biological and cultural diversity founded by Vandana Shiva in India, it sought to intensify twenty five years of work promoting seed freedom and the rejuvenation of indigenous agricultural knowledge into a fortnight of actions that ran from Mahatma Gandhi's birthday (Oct 2) to World Food Day (Oct 16). Urging citizens worldwide to resist the control of seed supply by global multinationals, Shiva argues for a return to the higher authority of Gaia and that we creatively disobey the patenting of life by saving and exchanging our own seeds. For Seed Freedom Fortnight in my neighbourhood, Milkwood Permaculture hosted a conversation between Costa Georgiadis and Jude & Michel Fanton of theSeed Savers Network. Formed in Northern NSW in the 1980's and the beginnings of the permaculture movement, the Fanton's were encouraged by Bill Mollison to expand their intention to start a Nimbin/Tuntable Falls seed savers group into a national network to widely communicate the politics of emerging seed control and commercialization. Starting by saving locally adapted seed in their bio-region, they soon had people sending them rare and unusual seeds from which they established a seed bank to preserve the diversity of our food plants. They've gone on to work on, research and document seed saving in thirty-nine countries worldwide - including with Navdanya and Vandana Shiva in India - and produce The Seed Savers' Handbook. In 2000 the Fanton's moved to to de-centralise the seed bank and network into local seed saving groups, and Jude Fanton made an interesting point suggesting that successful projects should have built-in obsolescence - enabling new initiatives and the next generation to develop and overtake their forerunners. Taking a de-centralised approach was necessary and logical in the Seed Savers' case, allowing locally adapted seeds to remain in situ. As well as keeping them in the hands of many (rather than concentrated and vulnerable in one location - "Don't put your eggs in one basket") and in the communities best able to preserve and multiply them. One of the joys of this conversation event was the set up of a seed swap table, where guests were invited to offer and swap seeds, seedlings and produce from their home gardens. 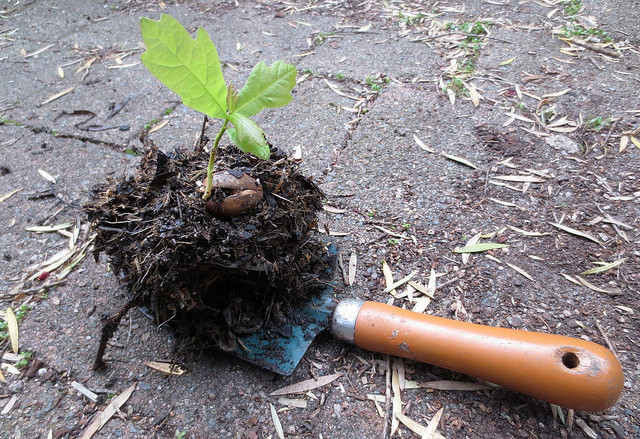 I was able to take along a number of the seedling oaks popping up in my Newtown backyard (!) after some enthusiastic acorn gathering in the autumn. These were happily despatched to a life in the country out at Milkwood and swapped for a host of unusual plant seeds, cuttings and seed potatoes. It was a beautiful model of a micro exchange economy and demo of local abundance. Vandana Shiva described Seed Freedom Fortnight as an "open ended series of actions" and insists that "It's not that we won't act on other days. Every day, every meal, every season is a day for action." To get started she recommends signing the Declaration on Seed Freedom, reading up on the issues of seed sovereignty and starting to save seeds and declare our communities seed freedom zones. In Sydney, the Inner West Seed Savers group meets monthly in the Eco-Library at The Bower in Marrickville. The last meeting for the year will be this Sunday 16th December 2-4pm. Join local permaculturists and seed saving experts Michele Margolis and Jane Mowbray among others for a natter while gleaning seed know-how and growing the library of locally adapted food plants. WWOOFing gives you the opportunity to work on Australian Organic Farms, exchanging 4 - 6 hours work per day for your meals and accommodation, usually in the family home. Inspired by the Arab Spring revolutions and Occupy movements blossoming on Wall St, across the US and throughout Europe, activists in Sydney gathered on Saturday 15th October 2011 at Martin Place, Sydney, at 2.30pm to launch the Occupy Sydney movement. It intended to camp out indefinitely in the Sydney CBD, to organise, discuss and build a movement for a better world, truly democratic, in an attempt to raise awareness and the support of the 99% of the population to reclaim the power currently held by the super-rich “1%” individuals and corporations. 'They are saying we are all losers, but the true losers are down there on Wall Street. They were bailed out by billions of our money. We are called socialists, but here there is always socialism for the rich. They say we don’t respect private property, but in the 2008 financial crash-down more hard-earned private property was destroyed than if all of us here were to be destroying it night and day for weeks. They tell you we are dreamers. The true dreamers are those who think things can go on indefinitely the way they are. We are not dreamers. We are the awakening from a dream that is turning into a nightmare.' - full transcript of Slavoj Zizek speaks at Occupy Wall St, October 2011. Transition Towns (also known as Transition network or Transition Movement) is a grassroots network of communities that are working to build resilience in response to peak oil, climate destruction, and economic instability. Transition Towns is a brand for these environmental and social movements “founded (in part) upon the principles of permaculture”. Ted Trainer's Q & A Part Three on Transition Culture: an evolving exploration into the head, heart and hands of energy descent. David Holmgren's permaculture principle 10. Use & Value Diversity "Don't put all your eggs in one basket". Manifestos on the Future of Food and Seed edited by Vandana Shiva, featuring essays by Carlo Petrini, Michael Pollan, Prince Charles, Vandana Shiva, Jamey Lionette and the International Commission on the Future of Food and Agriculture. South End Press, 2007. Join the Seed Freedom Movement. Seed is the source of life and the first link in the food chain. Control over seed means control over our lives, our food and our freedom. The Seed Savers Network have sparked community seed action in Australia and in thirty-nine countries since 1986. The Manifesto on the Future of Seeds outlines ways and means to strengthen and accelerate the movement toward sustainable agriculture, food sovereignty, biodiversity and agricultural diversity and help defend the rights of farmers to save, share, use and improve seeds, as well as to enhance our collective capacity to adapt to the hazards and uncertainties of environmental and economic change.